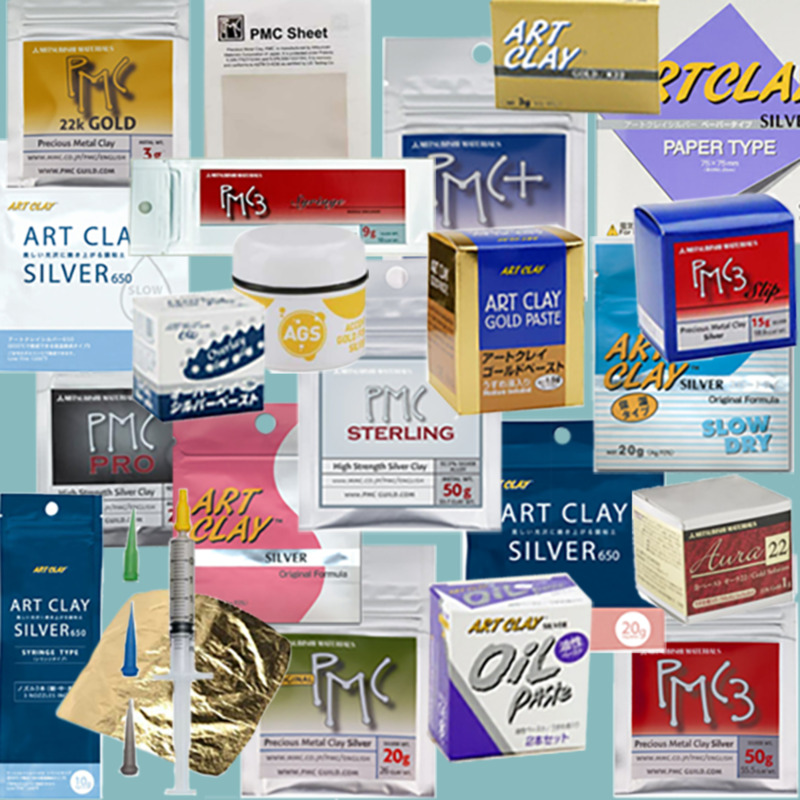 The two dominant brands of silver and gold metal clay are PMC and Art Clay. This article describes the key characteristics of each metal clay formula from those two brands and includes the clay types (lump, syringe, paper, paste, overlay paste) available for each formula. This article also covers the new 950 enriched sterling silver clay from Metal Adventures as well as Aura 22 and Accent Gold for Silver 2 (AGS 2) 22K and 24K gold paints for accenting fine silver. Currently, this article does not cover other brands of silver clay formulas, such as Aussie Metal Clay and MetalMagic. To learn more about the different types of metal clay and the uses of each type, please see my article on Types of Metal Clay—Lump, Paste, Syringe and Paper. 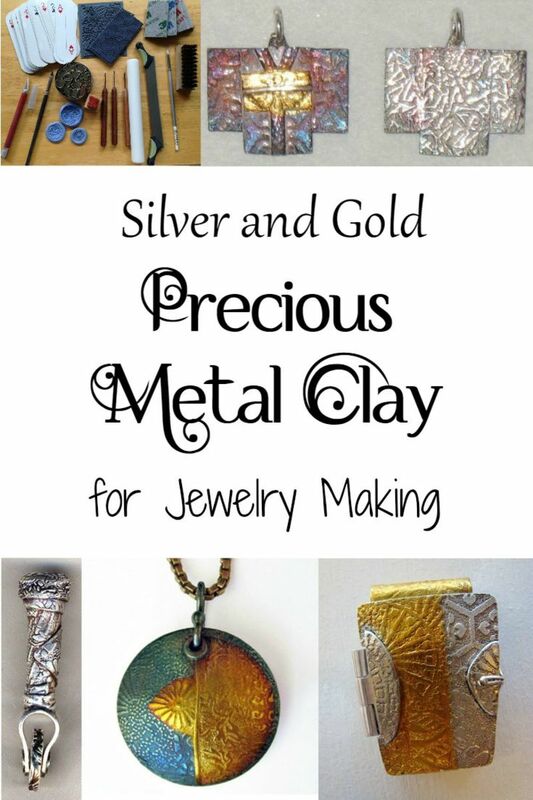 For a guide to the best metal clay instructors, suppliers, artists, classes, articles, projects and more, please see my article Precious Metal Clay / PMC and Art Clay Silver and Gold. Art Clay vs. PMC: What's the Difference? Art Clay was developed by Aida Chemical Industries Ltd. Precious Metal Clay was developed by Mitsubishi Materials Corporation of Japan. They're two different brands of metal clay. Which brand should you choose? There are some slight differences in consistency that are a matter of personal preference, like the taste of Lean Cuisine vs. Healthy Choice. I'd suggest you try a little of each and decide whether you like one better than another. I like and use products from both brands. 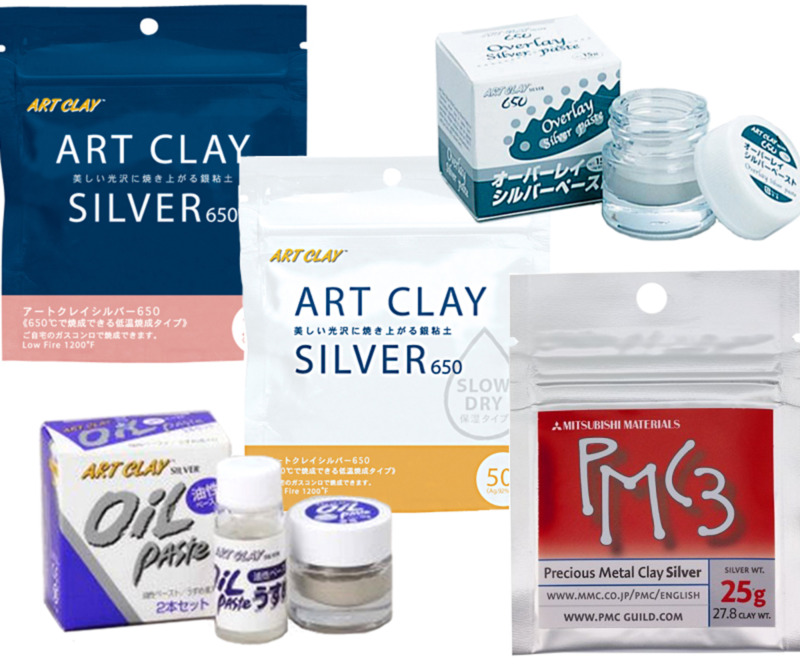 There are some products unique to each brand, such as Original PMC, PMC Pro, PMC Sterling, PMC Flex and Art Clay Silver oil paste and overlay paste. Your individual needs for what these unique products offer may dictate the use of one brand or another, either in general or on a project-by-project basis. As long as you use appropriate firing times and temperatures and take into account the differences in shrinkage, you can use products from both brands in a design, just as you can use different types of clay from the same brand in a design. After all, with the exception of PMC Sterling and PMC PRO, once the residual moisture and binders have burned off in the firing process, all the silver clays result in a piece that is 99.9% fine silver. Even if you generally prefer one brand over the other, you may want to take advantage of the unique products offered by the other manufacturer. 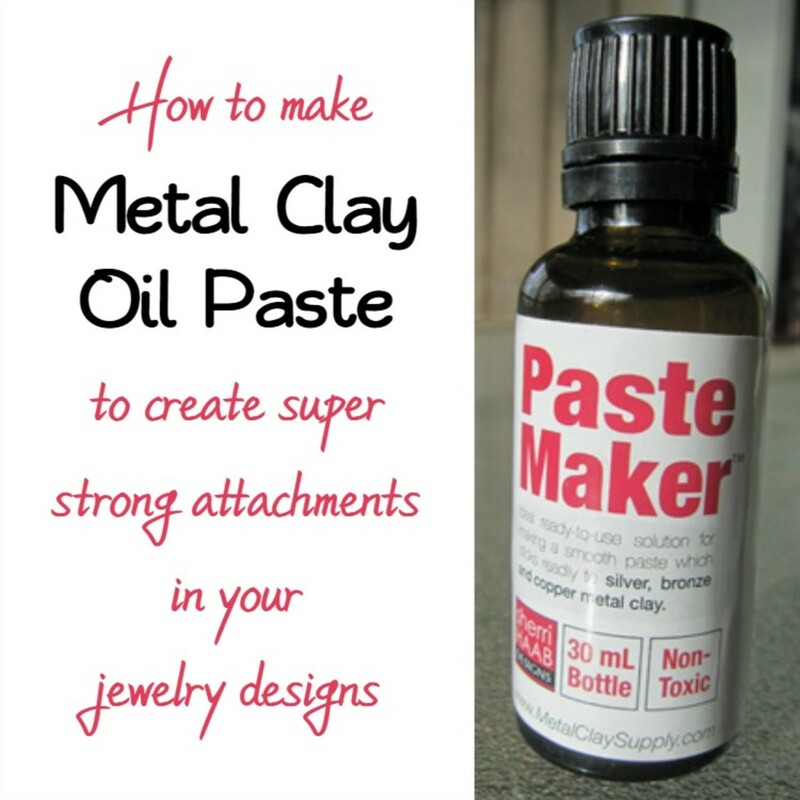 For example, many metal clay artists who use PMC predominantly swear by Art Clay Oil Paste for joining fired fine silver pieces or adding fine silver findings to already-fired silver clay. If you use Art Clay most of the time, you might want to incorporate Original PMC for an element that will be carved or for which you want its high-shrinkage properties, or use PMC Sterling or PMC PRO for their exceptional strength characteristics or PMC Flex for its indefinite flexibility "open time" until it is dried out with heat or fired. Today, five generations of silver clay formulas have evolved. Each has advantages and disadvantages for specific uses. And within some generations, there are some specialty formulas for specific applications. Newer fine silver clays tend to have smaller metal particles and lower proportions of binder and water than their predecessors, making them stronger, lower in shrinkage, and able to sinter (fully fuse the metal particles) faster and at lower temperatures. All fine silver formulas can be fired at up to 1650°F (900°C) for up to 2 hours. If you are firing something else with it—gemstones, armatures, findings or other inclusions—that may limit the firing time/temperature combinations you can use for that particular piece. All other things being equal, the longer and hotter the clay is fired (within the recommended firing schedule range), the stronger the resulting silver piece will be. Since hot spots can develop in your kiln as the heating elements wear over time, some artists prefer to fire at a somewhat lower temperature (1550°F–1600°F / 843°C–871°C). Later generations of clay provide options that can accommodate a wider range of inclusions including sterling silver, glass and certain natural gemstones. The reformulated Art Clay Silver combines the best characteristics from its previous generation formulas. PMC Flex is a fine silver clay formula that, like PMC+ Sheet and Art Clay Silver Paper Type, remains flexible indefinitely until is hardened via heat drying or sintered by firing. Later generation silver clay formulas brought silver and copper alloys with increased strength. The first of these, PMC PRO (discontinued) and PMC Sterling, needed to be fired in activated carbon inside a kiln-safe container. The newest are 950 and 960 enriched sterling clay formulas that don't need carbon firing and can be fired on an open kiln shelf. Gold clay formulas have evolved as well. 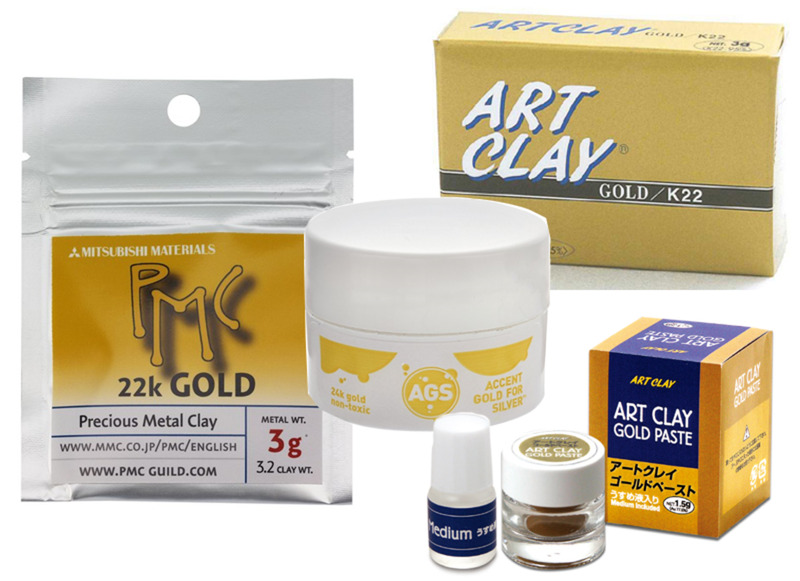 Mitsubishi discontinued the original 24K PMC Gold formula and replaced it with a lower-firing 22K formula that has superior characteristics for most applications and more flexible options for firing and combining with silver clays. Art Clay Gold has always been 22k gold. The first commercial metal clay formula. While second- and third-generation clays have improved in many respects, the original formula is still a wonderful choice for applications that can take advantage of its unique characteristics, such as high shrinkage and ease of carving. 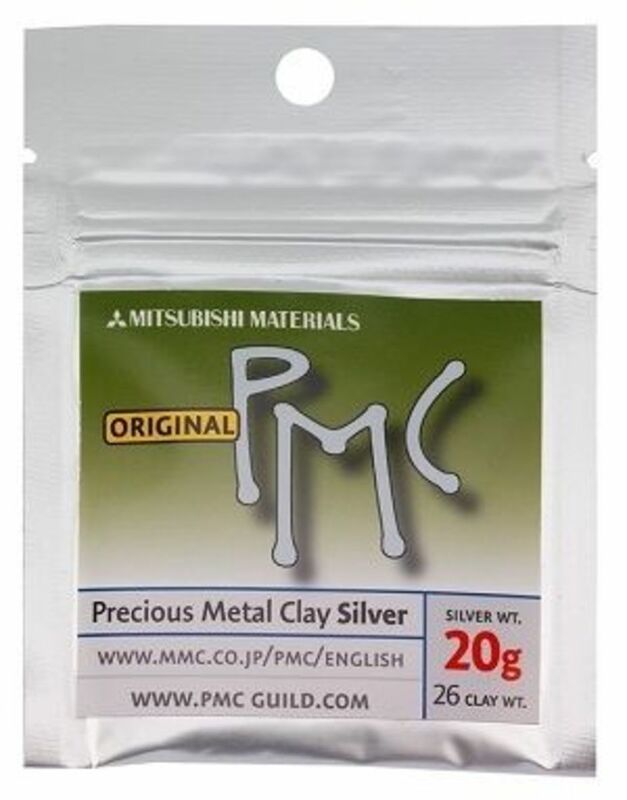 Unfortunately Original PMC has been discontinued, so if you still have any of it or can get your hands on some from someone who does, there's a lot you can do with it that you can't do with low shrinkage silver clay. Contains the largest silver particles and the most binder of all the silver clays. Shrinks approximately 28% (and, therefore, can produce sharper details after firing in carved or textured items). Firing options: None. Must be kiln-fired for 2 hours at 1650ºF (900ºC). As Tim McCreight likes to say, any metal clay (that uses an open air / atmospheric firing) can be torch fired in theory, but who is going to hold the torch for 2 hours? Carves easily without crumbling because of the high proportion of binder. Dries out less quickly than subsequent generations of fine silver PMC and, therefore, provides a little longer working time. Is not as strong as subsequent generations of silver clay and is somewhat more brittle after firing. When dry, it is quite sturdy compared to other silver clay formulas, so it can be handled and transported with less risk of breakage. Is more porous after firing than subsequent generations of silver clay, and therefore tends to absorb solder. If you must solder on fired Original PMC, burnish the affected area very well first. Items that will not be subject to a lot of wear and tear (e.g., earring dangles are suitable; rings are not). Items without inclusions that cannot withstand the necessary firing time and temperature. Items that can take advantage of the high shrinkage properties of the clay. For example, using a single mold to making earrings out of PMC Standard and a matching pendant out of PMC3. After firing, the earrings will be significantly smaller than the pendant. Or attach a layer of PMC+ or PMC3 to a base layer of PMC Standard. Since the base layer shrinks more than the top layer during firing, it creates a domed effect. Mixing your own custom shrinkage clay formulas. As long as you fire the item at 1650ºF (900°C) for 2 hours, you can mix Original PMC with PMC+, PMC3 or PMC Flex in different proportions to achieve variable shrinkage rates. A mixture of 50% Original PMC with 50% PMC+ or PMC3 would yield a clay with a shrinkage rate of approximately 19–21% (midway between PMC Standard's 28% shrinkage rate and the PMC+ / PMC3 / PMC Flex 10–15% shrinkage rate). Combining 2 parts PMC Standard with 1 part PMC+, PMC3 or PMC Flex would yield a mixture with a shrinkage rate of approximately 22–24% (28% x 2 plus 10–15%, divided by 3), and so on. The precise calculations aren't important, but the principle is useful to know. Create identical components in a variety of sizes by mixing varying proportions of Original PMC with PMC+, PMC3 or PMC Flex. Create the pieces identically in their clay form and let the magic of the shrinkage do the sizing work for you. The second-generation silver metal clay formulas contain smaller, more uniformly-sized particles of silver and less binder. They can be fired at lower temperatures and, therefore, can accommodate a wider range of inclusions (such as gemstones). They can also be torch-fired. These clays can be fired according to your choice of multiple firing schedules (the higher the temperature, the shorter the minimum firing time needed). Is available in lump clay, paste, syringe and paper types. For pieces with no inclusions or non-heat-sensitive inclusions (including fine silver wire, findings, etc. ), fire at 1560ºF to 1650ºF (850ºC to 900ºC) for at least 30 minutes. If firing with glass, gemstones or other kiln-safe inclusions that are heat-sensitive but can tolerate this firing schedule, fire at 1425ºF (775ºC) for at least 30 minutes. Small pieces may be torch-fired. See metal clay torch firing video demos from Tim McCreight, Jill Erickson of Art Jewelry Magazine and Jeannette Froese LeBlanc of Metal Clay Artist Magazine below, but hold at the red-orange glow for at least five minutes instead of two minutes, since the silver particles in PMC+ are larger than those in PMC3 and take longer to sinter at the same temperature. An excellent all-around clay for most applications. Accepts texture well, excellent for molding applications. Is available in lump clay and paste types. Small pieces (no larger than a silver dollar and no heavier than 25 grams) may be torch-fired, with certain exceptions. An excellent all-around clay formula for most pieces that don't have inclusions that require cooler firing temperatures. Moister formula than Art Clay Silver - Standard allows up to five times longer working time. Takes much longer to dry thoroughly before firing. Takes impressions and textures well. Can be extruded from an empty syringe. Can be fired with other clay formulas but not mixed with them. 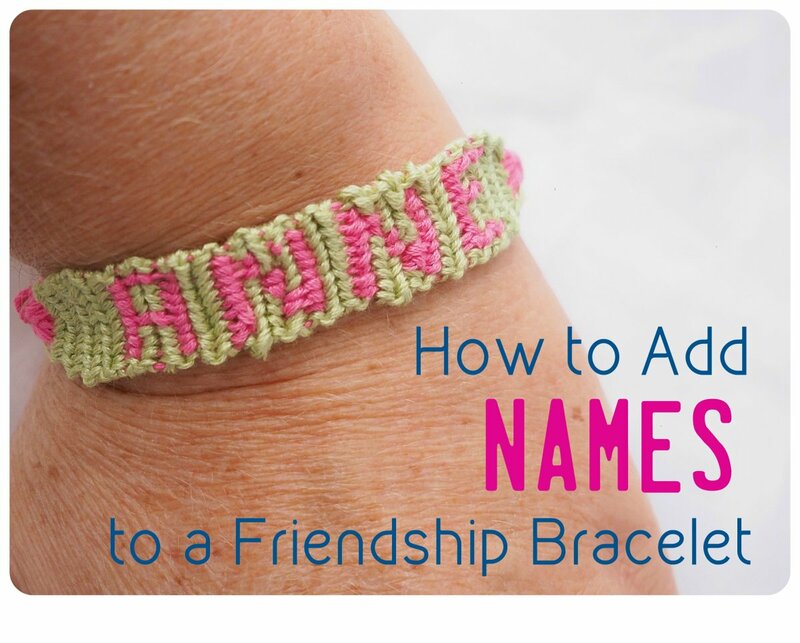 Time-consuming techniques like braiding, weaving, or complex designs. Working in very dry environments (such as arid climates or air-conditioned rooms). Designs that involve rolling coils/snakes or extruding clay. Designs that can be created in components no thicker than 3 mm (so that the clay can dry all the way through without cracking.) Note: Dried components can be layered to make larger/thicker designs. Third-generation silver metal clay formulas can be fired at even lower temperatures than and, therefore, can accommodate an even wider range of inclusions—not only more temperature-sensitive gemstones but also glass. They can also be torch-fired (although not all inclusions can withstand torch firing). They offer an even wider choice of firing schedules, depending on your needs and the inclusions, if any, you are embedding. Again, the higher the temperature, the shorter the minimum firing time needed, and the longer and hotter the firing schedule, the stronger the metal after the clay has sintered. Shrinks approximately 10–15% during firing. Is available in lump clay, paste, and syringe types. Is more expensive than PMC+. Can be fired as low as 1110°F (600°C), the lowest sintering temperature for any metal clay formula. PMC3 offers a wide range of firing schedule options for PMC3. See the table, below. Small pieces may be torch-fired. If you are forming the clay around or over combustible organic materials (e.g., wood, leaves, pods, seeds), start by firing at 800°F (425°C) for 30 minutes to allow the material to burn out. Then increase to the target temperature and follow the desired firing schedule. 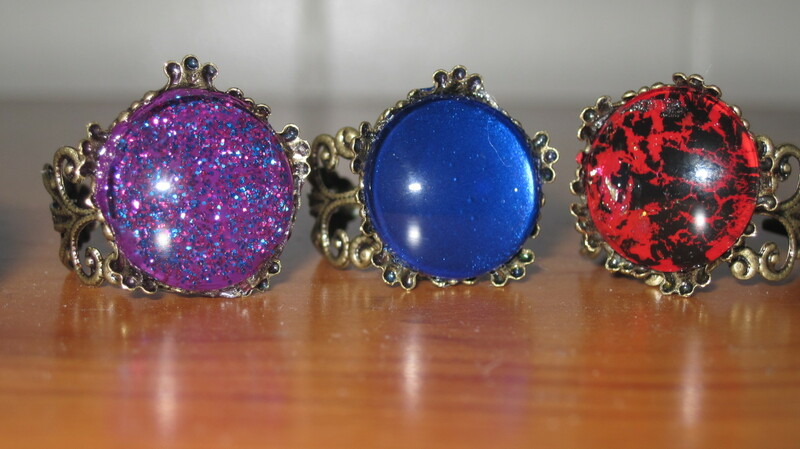 Rings and other items that require more durability. Pieces with embedded glass, gemstones, sterling silver or other materials that cannot withstand high firing temperatures. None or non-heat-sensitive inclusions, including fine silver wire, findings, etc. Is available in lump, paste and syringe types. After firing, it has a slightly cooler-toned (bluer) silver brightness than the Art Clay Silver - Standard formula. A wide range of gemstones, glass, sterling silver wire/findings, and other inclusions can be embedded and fired successfully at the coolest/shortest firing schedule of 1200°F (650°C) for 30 minutes. Small pieces (no larger than a silver dollar and no heavier than 25 grams) may be torch-fired, with certain exceptions. See the torch firing instructions on the Art Clay World site for detailed instructions and exceptions. Embedding glass and gemstones that cannot withstand higher firing temperatures. Fire at 1200°F (650°C) for 30 minutes. Embedding sterling silver findings. Fire at 1200°F (650°C) for 30 minutes to avoid fire scale. Combines the advantages of both low fire and slow drying clay. Provides up to four times as much working time as Art Clay Standard (slightly less than Art Clay Standard - Slow Dry). Can be fired at temperatures as low as 1200°F (650°C). Small pieces (no larger than a silver dollar and no heavier than 25 grams) may be torch-fired, with certain exceptions. See Art Clay World's torch firing instructions for detailed instructions and exceptions. Projects that require both lower firing temperatures and longer working times. Easier to carve and file in the greenware state. Higher proportion of silver in syringe clay so extruded lines hold their shape better. Formulated to absorb moisture better, making it easier to reconstitute dried silver clay. Any fine silver clay project. Oil-based, must be thinned with the diluent provided (not with water). Kiln firing: 1472°F for 30 minutes (when repairing broken, previously fired fine silver clay pieces, attaching fine silver findings or joining fine silver bezel wire seams. Torch firing: May be fired with a butane torch only to join the seams of fine silver bezel wire as an alternative to kiln firing. Repairing broken fired silver metal clay pieces. Attaching fine silver sheet, milled or cast metal, e.g., attaching fine silver findings or joining fine bezel wire seams. Water-soluble silver paste formulated specifically for adding raised, dimensional pure silver decorations to glazed porcelain. Also may be used on ceramic, glass and other smooth, nonporous surfaces that can withstand kiln firing. Thick and viscous, allows you to "paint" three-dimensional drawings on any of the above-mentioned surfaces. Is 99.9% silver (fine silver) after firing. Should be applied less than 0.5 mm thick to avoid eventual separation from the substrate. Hold the porcelain, ceramic or glass by the edges and clean the surface with alcohol or soap and water to remove dust, oil, and/or fingerprints. (If using soap and water, rinse and dry well.). Avoid touching the surface with your fingers during or after cleaning. Thin the overlay paste with water to a consistency suitable for painting it onto the surface. Apply the paste with a small paintbrush making the past layer less than 0.5mm. Position the nozzle of a 1200 Watt hair dryer (blow dryer) within 15cm (6") from the piece and blow on it for at least 10 to 15 minutes. Dry the piece in a food dehydrator (dedicated to metal clay only): set to 60°C (145°F) for at least 10 minutes. Place in a 180°C (330°F) oven for at least 7 minutes. Place on a hotplate or cup warmer for at least 7 minutes at 150~180°C (300–330°F). Place in a 150°C (300°F) kiln for at least 7 minutes. Air dry at room temperature for at least 1 hour. Important: Do not heat above 250°C (450°F) or the binder will begin to burn away prematurely. Firing overlay paste applied to porcelain alone: Place the piece in a cold kiln and ramp the kiln slowly, taking at least 15 minute to reach the target temperature (650°C–800°C (1200°F–1472°F). No hold time is needed. As soon as the kiln has reached the target temperature, turn it off and allow it to cool down slowly to 100° C (210°F). Do not open the kiln while the kiln is cooling. Firing overlay paste applied to porcelain in combination with the new Art Clay Silver formula or Art Clay Silver 650/1200: Place the piece in a cold kiln and ramp the kiln slowly, taking at least 15 minute to reach the target temperature. After the appropriate hold time at the target temperature, turn off the kiln and allow it to cool down slowly to 100°C (210°F). Do not open the kiln while the kiln is cooling. Firing overlay paste applied to porcelain in combination with Art Clay Silver Standard: Place the piece in a cold kiln and ramp the kiln slowly, taking at least 15 minute to reach the target temperature of 800°C (1470°F)—and no hotter! No hold time is needed. When the target temperature has been reached, turn off the kiln and allow it to cool down slowly to 100°C (210°F). Do not open the kiln while the kiln is cooling. For applications not involving porcelain, ceramic or glass substrates, including repairs or attachments of fine silver metal including fired silver metal clay:Any of the following firing schedules may be used depending on the other materials being fired (e.g., gemstones). Always place these items into a cold kiln before turning it on. Target temperature: 650°C (1200°F); hold time: 30 minutes. Target temperature: 700°C (1290°F); hold time: 15 minutes. Target temperature: 750°C (1380°F); hold time: 10 minutes. Target temperature: 780°C (1435°F); hold time: 5 minutes. Target temperature: 800°C (1472°F); hold time: None. DO NOT QUENCH fired pieces of glass, porcelain or ceramic or they are likely to crack from thermal shock! Painting onto glazed porcelain, glazed ceramic or glass to add pure silver decorations. Substituting for Art Clay Silver Oil Paste for repairing fired fine silver pieces that must be re-fired at low temperatures because of embedded stones or other heat-sensitive, safe-to-fire inclusions. Adding additional detail or embellishment to fired fine silver clay pieces. Painting on fine silver (including fired fine silver clay) as an intermediary layer before applying Art Clay Gold Paste, Aura 22 or Accent Gold for Silver that will be torch fired. Painting on glazed or unglazed porcelain as an intermediary layer before applying Art Clay Silver lump or syringe clay embellishments. Commercial Sterling Silver Clay Finally Arrives! In the Fall of 2010, a new silver metal clay formula completely unlike any of its predecessors was introduced: PMC Pro—an alloy of 90% silver and 10% copper. PMC PRO has a surface (Vickers) hardness that is the same as cast fine silver, and twice that of fine silver metal clays, and much higher tensile strength and bending strength. Unlike fine silver metal clay formulas, PMC Pro must be kiln fired in activated carbon. Many artists loved the strength of PMC Pro but were not interested in working with silver with a lower purity than sterling silver. Lisa Cain of the Mid Cornwall School of Jewelry developed a recipe and firing method and schedule for mixing hallmark-quality sterling silver clay from existing metal clay formulas, but that was not an ideal solution. 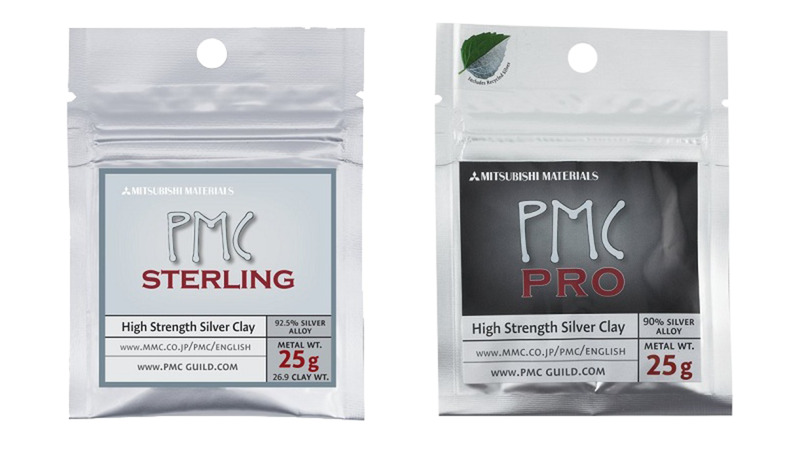 Metal clay artists were delighted when PMC Sterling was added to the PMC product line in December, 2011. PMC Pro was discontinued not long thereafter. More recently, PMC OneFire Sterling was introduced, which can uses a one-step, open-air firing process and does not need to be fired in carbon, like PMC Sterling. Shrinks approximately 15–20% during firing. Is available as lump clay. Extremely easy to carve without chipping (similar to Original PMC in that respect). By far the strongest of the silver clay formulas after firing. Surface hardness is equal to that of cast sterling silver. Should not be fired with Original PMC, PMC+, or glass. Fine silver, copper, brass or sterling silver wire or findings can be embedded and fired successfully. Is more expensive than PMC3. Must be kiln-fired in activated carbon. Cannot be torch-fired. 1400°F (790°C) for 1 to 2 hours. If firing pieces combining PMC Pro (greenware or already fired) with PMC3 greenware, fire on an open kiln shelf at between 1000°F (540°C) and 1400°F (790°C) for 30–60 minutes. Transfer to activated carbon and re-fire at 1400°F (790°C) for 1 to 2 hours. Rings, cuff bracelets, hinges, clasps, and other items that require maximum durability. Thin tendrils, pieces that need to be rolled thin and still remain very strong. Pieces that will be subjected to significant amounts of forging, re-shaping (e.g., firing a thin, flat ring band and shaping it around a mandrel after firing), or stretching (e.g., enlarging a ring band after firing). Pieces that will be carved. More than twice as strong as fine silver metal clay. Also more durable than fine silver clay in the greenware state (dried but before firing). Excellent workability, longer open time. Wonderful for carving (carves similarly to PMC Original). Phase one—binder burnout: Place thoroughly dried PMC Sterling greenware on an open kiln shelf in a kiln. Ramp kiln to 1000°F (538° C) and hold for at least 30 minutes, longer for thick pieces. Allow the partially-fired pieces to cool. Phase two—sintering: Pour a 1/2" (10 mm) layer of activated carbon into a firing pan and carefully transfer the fragile, partially-fired pieces onto the carbon layer, spacing them at least 1/4" apart. Gently pour more activated carbon over the pieces so that the high points are covered with a 1/2" (10 mm) deep carbon layer. Cover the firing container with a lid and place it in the kiln on stilts (kiln furniture or small pieces of kiln shelf scrap) so air can circulate under the pan as well as around and over it. Ramp the kiln to 1500°F (815°C) and hold for at least 30 minutes. Firing 1–2 hours for large pieces, thick pieces, volumetric pieces, or multiple pieces in the same kiln load. Ventilation during firing is recommended. Allow the work to cool inside the carbon. Rings / ring shanks, prongs, cuff bracelets, hinges, clasps, and other items that require maximum durability. Celie Fago pioneered the use of .960 enriched sterling silver clay (sometimes referred to as "960 sterling" clay at the beginning of 2014. At the time, the formula was not yet manufactured commercially, but rather mixed at home by thoroughly mixing equal parts of sterling and fine silver clay for about three minutes until they are completely blended. You can read about the process of mixing 960 sterling clay on Celie's blog and also watch a three-minute video in which she demonstrates the process. Enriched sterling clay has compelling advantages, especially strength and the ability to fire it without carbon, that quickly made 960 extremely popular, especially among professional jewelry artists. Suppliers started selling combo packs of sterling and fine silver clay specifically for the purpose of mixing this new formula. More than two years later, manufacturers finally are offering commercial, pre-mixed and ready-to-use enriched sterling clay formulas. Note: Since enriched sterling clay is an alloy, it's can be a good idea to knead it to redistribute the copper particles evenly throughout the silver, especially if you don't know how old the package is. This enriched sterling clay, distributed and marketed by Cool Tools, was formulated by Bill Struve, Ph.D. of Metal Adventures, the inventor of BRONZclay and COPPRclay. Shrinks approximately 10% to 11% after firing. 96% silver / 4% copper alloy. Much stronger than fine silver clay (nearly 50% stronger). Easier to carve and slower drying than 999 silver clay. Very thin sheets (1 to 2 cards thick) retain some flexibility when leather hard. Open shelf kiln firing; no carbon required. Brighter in appearance than 925 sterling clay. Fired pieces may legally be hallmarked sterling (925). In the UK, they may be hallmarked as Britannia silver (958). Note: Covering the kiln shelf with thin ceramic kiln paper (e.g., Bullseye ThinFire) or a thin layer of crushed vermiculite to prevent the clay from sticking to the shelf. Fiber blanket (AKA kiln blanket) can stick to the clay and therefore is not recommended. Applications that require strength, such as ring shanks, bangle or cuff bracelets, and hinges. Thinner or more slender elements than could be made from fine silver clay without risking breakage. Thin cut-outs, applique elements, etc. to be cut on an electronic cutter, e.g., Silhouette. For more information, see Cool Tools' EZ960 Sterling Overview & Firing Guide. In the following video Dr. Struve describes how he came up with EZ960 Sterling and explains the properties that give it so many advantages over fine and sterling silver clay formulas. This enriched sterling clay has slightly less fine silver than the 960 formula (95% vs. 96%), but the one percent difference is insignificant in terms of their essential properties. 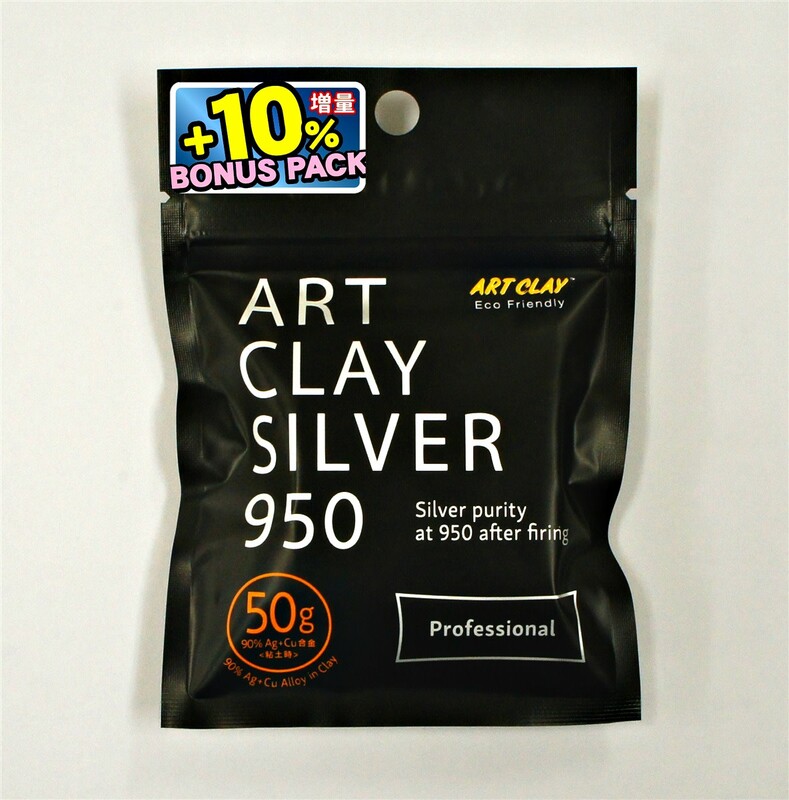 According to Art Clay, its ACS 950 Professional is 50% stronger than the current regular Art Clay Silver formula. Shrinks approximately 10% to 13% in length after firing. 95% silver / 5% copper alloy. 50% stronger than regular Art Clay Silver. 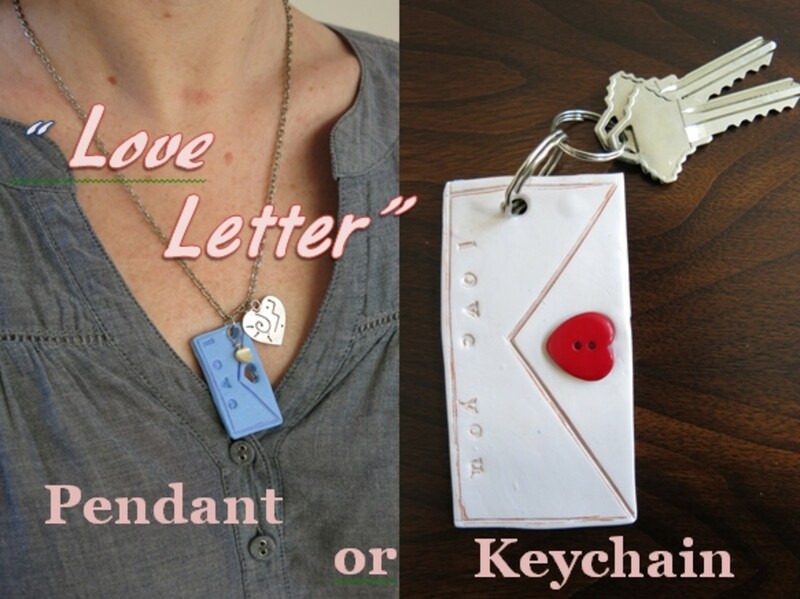 Dried clay retains some flexibility thin sheets (1 to 2 cards thick) retain some flexibility when leather hard. Fired pieces may legally be hallmarked sterling. Phase 1: Ramp kiln to 932°F (500°C) and hold at that target temperature for 30 minutes. Do not cool. Phase 2: Increase the kiln temperature to 1598°F (870°C); when that target temperature is reached, hold for 60 minutes. Turn off the kiln and cool to 392°F (200°C) or lower before removing the piece from the kiln. Same applications as 960EZ Sterling. 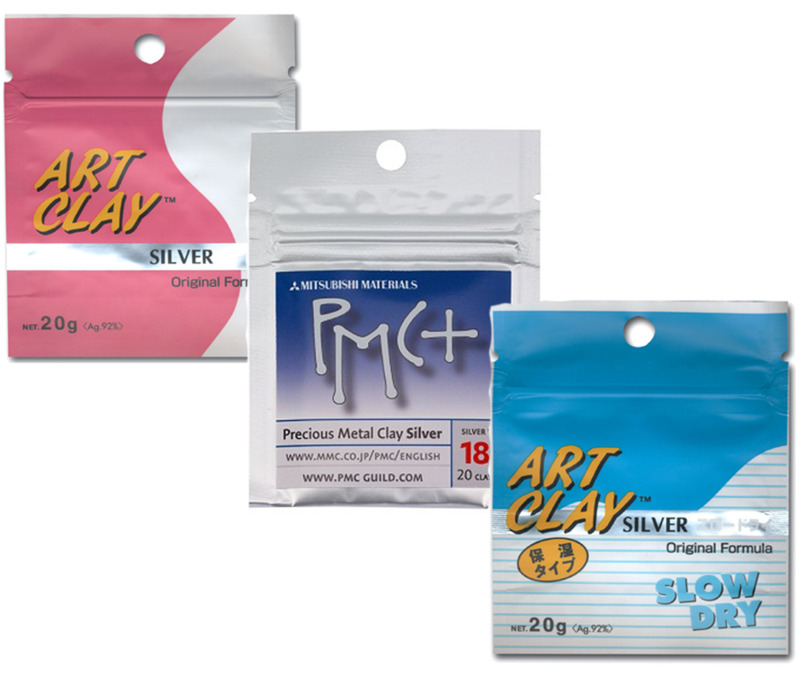 For more information, check out the Art Clay Silver 950 Basic Instructions and FAQ on Art Clay World. PMC OneFire Sterling is Mitsubishi's PMC branded 960 enriched sterling silver clay. Shrinks approximately 15% after firing. Full ramp to 1600°F to 1650°F (870°C to 900°C) and hold at target temperature for one hour. Applications that require strength (e.g., ring shanks, bracelets, hinges). For more information, see a larger version of the packaging insert from Mitsubishi, Getting Started with OneFire Sterling PMC. PMC gold 24K was the first metal clay formula developed. However, because of the comparatively high cost of gold, fine silver clay was the first to be commercially distributed. Results in 24K gold metal after firing. High shrinkage rate, greater than 25%. Firing options: Must be kiln-fired at 1800°F (980°C) for 2 hours. Adding 24K gold accents to silver; 24K gold is too soft to use for structural elements. Is 22K gold metal after firing. Available as lump clay only. Dries much more slowly than regular silver clay formulas. Drying PMC Gold overnight (24 hours) is highly recommended. Can be fired as low as 1290°F (700°C) for 90 minutes, so gemstones that can withstand that firing temperature and time can be fired in place. 1290ºF (700ºC) for at least 90 minutes. Torch-firing: Warm to drive out any remaining moisture and burn away the binder, bring to a vibrant, glowing red and hold at that color for 2–5 minutes. Items, areas or components that are not subject to a lot of wear, since high-karat gold is a soft metal alloy. Combining unfired gold clay and unfired silver clay elements (preferably made from PMC+ or PMC3, which have similar shrinkage rates, firing environments and firing schedules). Adding an unfired Gold PMC element to a fired silver clay piece with a mechanical connection (e.g., drill a hole into the silver metal and press the gold clay to fill the hole and "mushroom" over the ends of the hole, or wrap the gold clay around the fired silver so it will be shrink-locked in place after firing). Thinning with water to create Gold PMC slip that can be used to brush on 22K gold accents, similar to Aura 22. Results in 22K gold metal after firing. Shrinks approximately 15% during firing. Available in both lump and paste types. Cannot be fired with silver clay because of the hotter firing temperature required. Dries much more slowly than regular silver clay formulas. Requires hotter temperatures and longer firing times than silver clay. Must be kiln-fired at 1814°F (990ºC) for 60 minutes. Gold lump clay can be used for similar applications as silver lump clay. Because of the expense and softness of 22K gold, it is most often used for rich accents on silver designs. Paste type can be used to add texture or draw directly on the surface of fired silver clay, ceramic, porcelain or glass. It comes with a separate bottle of medium to dilute the paste when using on glazed surfaces. Otherwise, use it undiluted. Art Clay World's site provides detailed instructions and firing options for using Art Clay Gold, both lump clay and paste. There are several different ways to apply gold accents to silver metal clay or milled fine silver or sterling silver metal. You can apply heavy 23.5k or 24k keum-boo foil via the ancient Korean keum-boo method of diffusion bonding with heat and pressure, use an electroplating pen with gold electroplating solution, apply commercial or homemade gold metal clay paste, or apply one of the commercial 22k or 24k gold paints created for this purpose. Since this article focuses specifically on metal clay brands and formulas, I will not go into detail here about the keum-boo foil or gold electroplating options. In terms of applying gold paste to add gold accents to your silver metal clay creations, you can purchase commercially prepared Art Clay Gold paste or make your own paste by thinning gold lump clay with water (or glycerin diluted with water), mashing in a few drops at a time very thoroughly until you have achieved a smooth, very creamy consistency similar to that of heavy cream or thin custard. If the paste is too thin you won't get a nice, rich gold color. If it's too thick, it may flake off after being fired. Gold paste should be applied in thin layers that are allowed to air dry thoroughly, slowly and without heat (for several hours) in between coats and after the last coat, and then torch-fired to create a reduction atmosphere. An alternative to using gold metal clay paste is to use one of the commercially prepared 22k or 24k gold paints formulated specifically for this purpose. Aura 22 is a 22k gold paint, while Accent Gold for Silver (often referred to as AGS) is a 24k gold paint. Well-known artist and instructor Pam East shares her method for applying Aura 22 and Accent Gold for Silver to fired fine silver metal clay in her Gold Metal Clay Overlay Pendant project on the Facet jewelry making website. 22K gold "paint" made of tiny particles of pure metal (91.6% gold and 8.4% fine silver) in a water-based medium. Fuses with silver at low temperatures. Resulting gold layer is much thicker than that created via electroplating. Required preparation: Be sure the fired silver to which you are applying the Aura 22 is fresh from the kiln or torch and has not been scratch-brushed, burnished, or "cleaned" in any way before applying Aura 22. (The silver will never be cleaner than right after it has been fired!) If in doubt, or if the piece has been burnished or brushed or cleaned with soap, just put the piece back in the kiln for 5 or 10 minutes or torch-fire it again, then let it cool completely before applying the Aura 22. Kiln: Fire at 850°F (455°C) for 10–30 min. Torch: Heat slowly until the silver glows a radiant red. Fusing occurs instantly. Hotplate: Heat on medium-high until a piece of wood chars when touched to the PMC, then burnish until shiny before removing from heat. Hot Pot kiln: Normal firing sequence with 30 grams of gel fuel. JEC Ultra-Lite Beehive Kiln with red brass inserts: Preheat kiln for 20 minutes, heat fired silver until a toothpick chars, then burnish with a steel or agate burnisher until gold is smooth and shiny before removing from heat. In all cases, burnishing the gold while still hot is recommended. Note: Over-heating will make the gold become paler and appear to absorb into the silver. Remove the heat as soon as the gold appears shiny and smooth. As always, start with freshly-fired metal clay and avoid allowing your fingers to touch the areas where gold will be applied, as the oils from your skin can interfere with making a good bond. Apply 1-2 coats of custard-consistency PMC3 paste or Art Clay 650 where the Aura 22 will be applied. Let air dry completely (or use dehydrator or hair dryer on low heat to speed drying a bit - do not use cup warmer, hotplate or other heat sources other than those listed to accelerate drying). Try to minimize visible brush strokes. Apply 2-3 thin, even coats of Aura 22 and let air dry completely in between each coat (or use hair dryer on low heat to speed drying). Kiln firing: Preheat kiln and kiln shelf to 850°F (455°C). Place fired fine silver in preheated kiln. When temperature returns to 850°F (455°C), fire for 7 minutes. Remove from kiln immediately and place on a fiber blanket or fiberboard to cool. Burnish or tumble as desired. Torch, UltraLite kiln or SpeedFire Cone firing: Place prepared item on a Solderite board (for torch), ceramic insert (for UltraLite kiln) or grate (for SpeedFire Cone). Begin firing until you see a light orange glow (not red) and hold at that color for 4-7 minutes. Do not let the gold areas start to glow or the gold will begin to absorb into the silver. Cool and burnish as desired. Optional keum-boo "insurance": Once you remove the piece from the heat, hold it with a tweezer and burnish the gold with a pyrex, agate or steel burnisher. Adding richly-colored 22K gold accents to fine silver (including fired silver clay) or depletion-gilded sterling silver. Using painterly techniques to apply gold accents to fine silver. Adding gold accents to deeply textured surfaces that cannot be burnished effectively through the gold foil keum-boo technique. 24K gold "paint" made of pure 24K gold particles in a water-based medium. Tonya Davidson worked closely with the manufacturer to perfect the torch-firing method of applying AGS. Since she is an expert with this material, I am providing her application instructions. Apply 1–2 coats of custard-consistency PMC3 paste or Art Clay 650 where the AGS will be applied. Let air dry completely (or use dehydrator or hair dryer on low heat to speed drying a bit - do not use cup warmer, hotplate or other heat sources other than those listed to accelerate drying). Try to minimize visible brush strokes. Apply 2–3 thin, even coats of AGS and let air dry completely in between each coat (or use hair dryer on low heat to speed drying). Kiln firing: Preheat kiln and kiln shelf to 1650°F (900°C). Place fired fine silver in preheated kiln. When temperature returns to 1650°F (900°C), fire for 7–10 minutes. Remove from kiln immediately and place on a fiber blanket or fiberboard to cool. Burnish or tumble as desired. Torch, UltraLite kiln or SpeedFire Cone firing: Place prepared item on a Solderite board (for torch), ceramic insert (for UltraLite kiln) or grate (for SpeedFire Cone). Begin firing until you see a light orange glow (not red) and hold at that color for 4–7 minutes. Do not let the gold areas start to glow or the gold will begin to absorb into the silver. Cool and burnish as desired. Adding richly-colored 24K gold accents to fine silver (including fired silver clay) or depletion-gilded sterling silver. Color is deeper than Aura 22 because it's 24K gold vs. 22K gold. Adding gold accents to deeply textured surfaces that cannot be burnished effectively using keum-boo techniques. Lots of great information about products from several manufacturers and how to use them. This Tips and Techniques page lives up to its name! Note: The Art Clay Silver and Gold Product Guide needs to be updated with the current ACS formula. The PMC Guild ceased operations in July 2012. Fortunately, Rio Grande has archived many of the guild's resources on its site. Type "PMC" in the search bar and select "Articles and Videos" from the pulldown menu, then click "Go." From Mary Ellin D'Agostino of MED'A Creations, directions for using the new PMC 22K gold clay and the now-discontinued PMC 24K gold clay, both in lump form and as a homemade paste. Mary Ellin D'Agostino (or MED'A Creations) does her usual clear and thorough job of explaining how to torch-fire PMC+, PMC3 or Art Clay Silver. 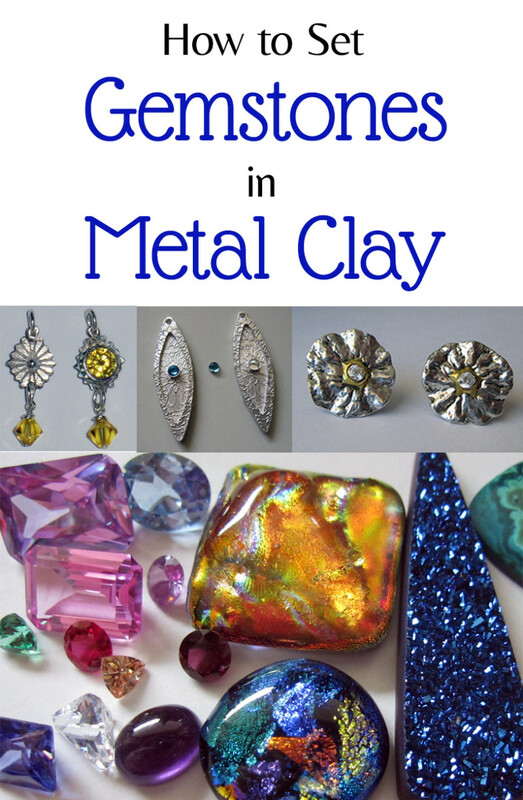 This link is for Part I of an excellent two-part metal clay project tutorial for beginners by Mardel Rein of Cool Tools. She demonstrates how to make textured rope earrings from metal clay. Part II includes a clear torch-firing demonstration. Mardel Rein of Cool Tools has put together a fantastic guide to the different PMC formulas and types, including uses, workability, suitability for embedded objects, and firing options. Highly recommended. Product images of Art Clay, AGS and 24k gold keum-boo foil are owned by Art Clay World USA and used with the permission of Jackie Truty and Art Clay World USA. Product images of PMC and Aura 22 are owned by Rio Grande and used with the permission of Kevin Whitmore and Rio Grande. Art Clay World USA is the primary US distributor of Art Clay and other metal clay products manufactured by Aida, and Rio Grande is the primary US distributor of PMC and other metal clay products manufactured by Mitsubishi. I am extremely grateful to Jackie and Kevin for kindly giving me their permission to use their companies' respective product photos in this article. Did You Learn Anything About Silver and Gold Metal Clay Brands and Formulas? I first learned of fine metal clay when a guest at my B&amp;B in Royalton,Vt came to stay for a class offered by Celie Fago. My guest was making silver clay jewelry. What beautiful pieces she made. I believe that the type of clay that you mention in this article is the type Celie suggests that her students purchase when she offers classes. @Margaret Schindel: Great lens and great products, you don't happen to have a lens on firing small pieces of metal clay with a small handheld butane kitchen torch do you? Wonderful lens. This is very interesting lens. I think not everyone can do this since it required a certain kind of instrument or machine. But to me this is still something great. I learn something new today. Thanks! 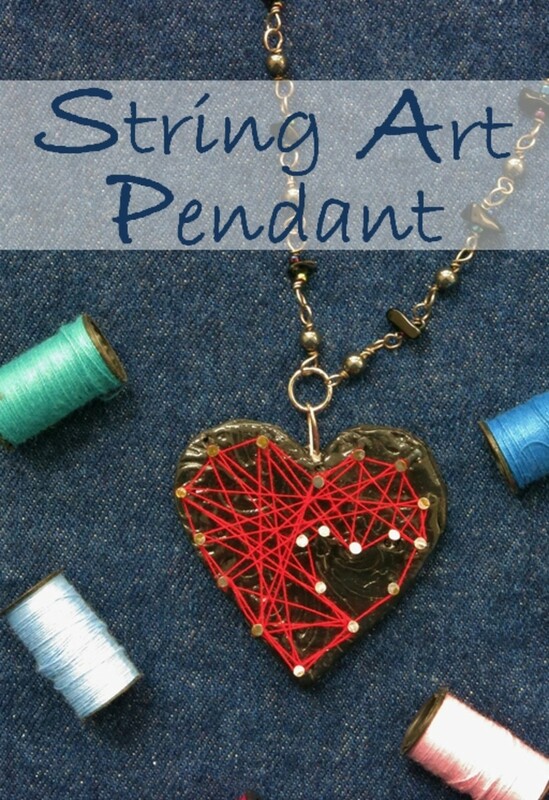 have given up and missed out on this great medium for my jewelry making hobby. This expands it greatly, into an area I would never have gotten to experience if it weren't for you. My bank account and I thank you from the bottom of our hearts! What a great and concise Lens! It's reall a treasure trove of information. Excellent! One suggestion: For those of us here in Europe that use CÂ°, it would have been good to include it next to the FÂ° temperatures. Thanks again! !